Below is a letter written to the Champion newspaper by Maghull resident Mal Gore who found a recent visit to a Council meeting hugely disappointing. Arriving at the meeting like a drowned rat, due to the torrential rain, I thought they were going to discuss amendments to the Local Plan as outlined by the government inspector but instead we had to endure two hours of behaviour more like that of an infant school playground. It was evident that, as far as the ruling party is concerned, the complete destruction of Maghull and Lydiate is one huge joke. Most of the time they were actually either congratulating themselves or making cheap jibes at the newly elected independent councillors, who are giving their time to speak and vote on behalf of the people who elected them. I realise that this is a concept alien to the councillors who currently represent us but they should try it sometime. Each jibe was treated with approval, especially by the ladies in the front row, all that was missing were a few balls of wool, some knitting needles and “Madame la Guillotine”. We were then treated to a maiden speech by a Sudell councillor elected TWO years ago. If ever you need a reason to reduce the number of councillors, then this is it. 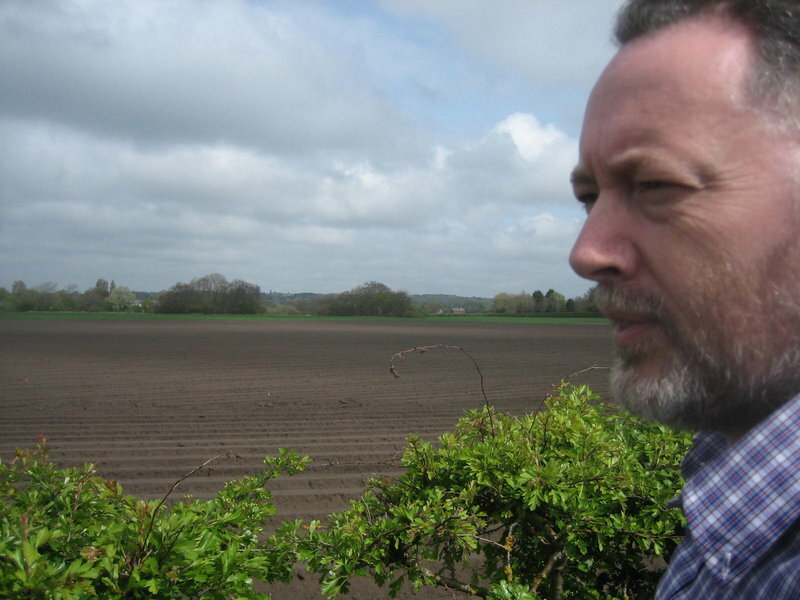 Readers will recall that I let slip that Labour had almost lost a by-election in Maghull a few weeks ago to an independent Green Belt campaigner – they clung onto the seat by just 3 votes. This was the election that for some very odd reason the local press decided not to report the result of and that suited Labour down to the ground. However, I knew they (Labour) would be rattled and therefore it was no surprise that when a Labour election leaflet popped through my door the other day that it was attacking the Green Belt campaigners that they are so frightened of. Under the heading of ‘Vote Independent, get Conservative?’ Labour are clearly trying to suggest that the independent candidate (in Park Ward) may be a Tory sympathiser. BUT the lady standing as the independent candidate was a Labour supporter until Labour said they would defend the Green Belt but then voted on Sefton Council to build on it! She is fighting Labour because they said one thing and did the opposite. 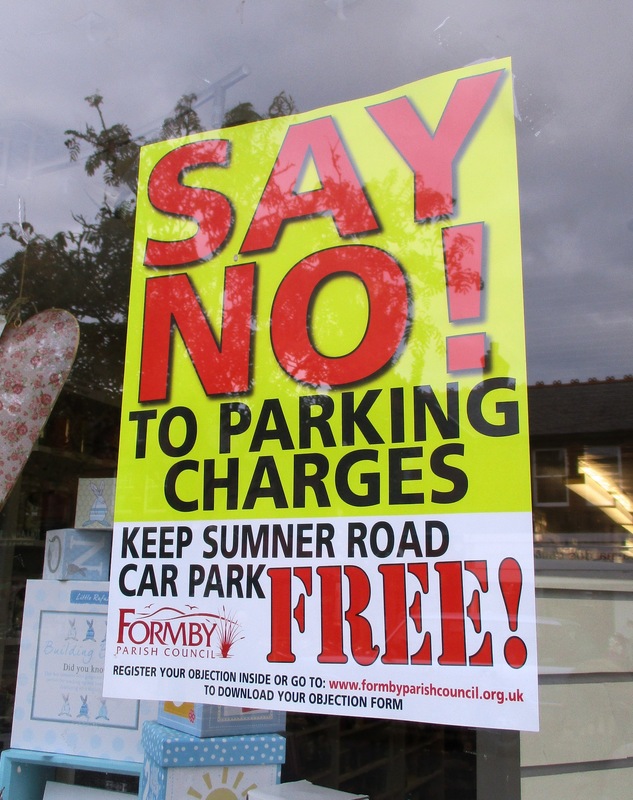 Readers may well remember that Labour-run Sefton Council is in the process of bringing in parking charges for this popular car park in Formby Village. Indeed, the issue has already split Labour locally with their Sefton Councillors backing the parking charges whilst the local Labour MP is publicly opposing them! So much for Labour unity, although if you read my previous posting you will notice that there has not been much Labour unity locally in recent times. 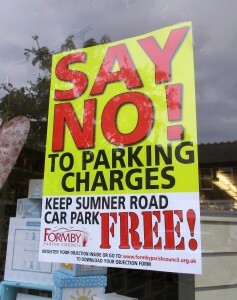 Formby Parish Council are leading the campaign against the charges but Formby also has 4 Labour Borough councillors! The Parish Council is run by people independent of the main political parties who are all experienced community and environmental campaigners. What’s more they gained that experience by opposing the same Labour-run Borough Council’s Local Plan which aims to concrete over vast swathes of Green Belt and high grade agricultural land across the Borough. 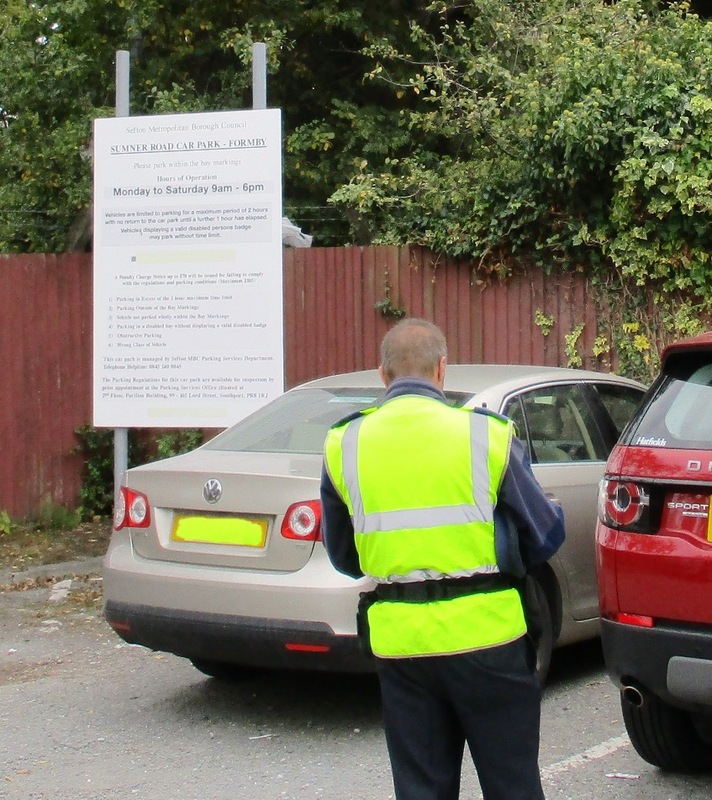 This was the scene in Sumner Road car park yesterday (17th October) afternoon where vehicles can presently be parked for up to 2 hours without charges. A traffic warden was clearly doing his rounds checking that no one was overstaying their welcome. Neighbourhood Plans – Are they Labour’s apology? Having spent a couple of years on Sefton Council’s Planning Committee as the Lib Dem opposition spokesperson (2013/14 and 2014/15) and fought Labour’s Local Plan for the Borough every inch of the way I now wonder if their enthusiasm for Neighbourhood Plans is their back-handed way of apologising for building on high grade agricultural land? 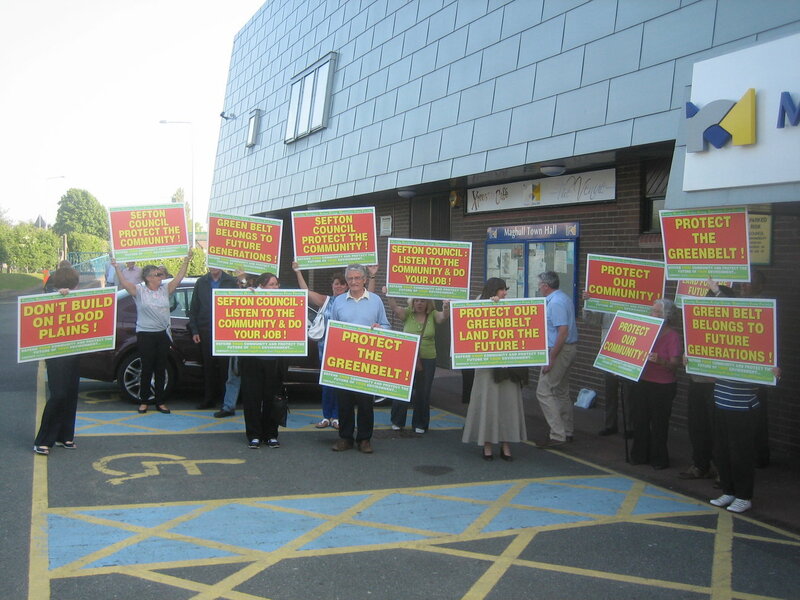 Green Belt campaigners, outside Maghull Town Hall. Neighbourhood Plans are a potentially useful but significantly limited tool to plan for the development of a town or village at a very local level but as I have said before, there is no point in doing one unless you know why you are doing it. They can cost the public purse a lot of money and they involve a huge amount of work and community involvement and in the end a referendum in the designated area. What’s more if they conflict with the local authority’s Local Plan (in our case Sefton Council’s) they get chucked out by a Planning Inspector anyway. Here I am at Lambshear Lane Lydiate checking out farm land that is coming under threat from house building. My view all along, as Sefton’s Local Plan was being developed, was that anyone or group in the Borough who wanted to see some specific planning issues included about their community should first of all use the Local Plan process to get such matters included in it. Why? Because it would save having to do a Neighbourhood Plan for your community. Oddly, Labour chose to seemingly not challenge what Council Officers wanted to see in the Local Plan for Sefton nor to come up with any innovative ideas for the Borough’s diverse communities. Of course they also backed a huge amount of building in the Green Belt on land that is virtually all the best and most versatile land for growing food in England! Now they want the communities of Sefton to produce Neighbourhood Plans, seemingly to try to mitigate the negative effects of their Local Plan! Certainly that’s how I see the Neighbourhood Plans for the two communities of Maghull and Lydiate, both of which are going to see vast tracts of high grade agricultural land go under concrete and tarmac if Labour has its way. 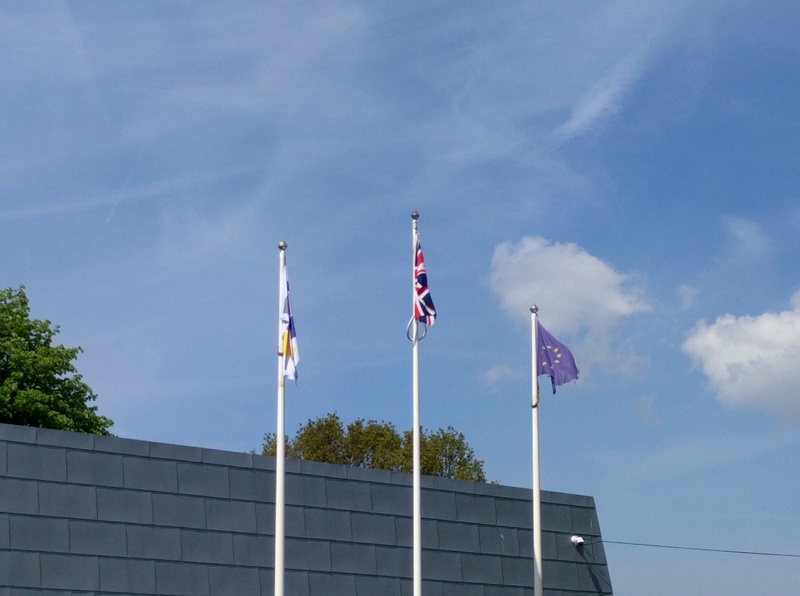 Maghull Town Council (in Labour’s grip) has been trying to produce its ‘apology’ Neighbourhood Plan for a while now and I have commented before about all the twists and turns of the odd process they have constructed. You may remember they (Maghull Town Council) did a survey but when we asked to see it we were told the data was held by the Labour Party! Then when we pressed the issue we were told it had been destroyed! Well the Maghull Neighbourhood Plan struggles on but the good folks of the Town seem less than interested in it. 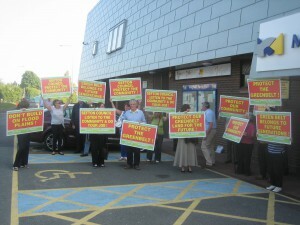 Now Lydiate, also under Labour Control, wants to do one as well and we discussed it at the last Parish Council meeting. All well and good but the clear reason for doing it can only be that they want to mitigate the effects of the Sefton Local Plan that Labour forced through Sefton Council. I am not opposed to them doing a Neighbourhood Plan in principle but if Labour had not imposed it’s Local Plan on the Borough in the first place then there would be no need for either Maghull or Lydiate to do a Neighbourhood Plan at all. How all this is meant to grab the hearts and minds of Lydiate folk to want to get involved beats me as an expensive and time consuming process is now in train simply because of Labour’s Sefton Local Plan. Funny old world is politics…….